July 2015 home sales on 30A reached an all-time high with 91 homes sold, totaling more than $102 million, according to Emerald Coast Association of Realtors. 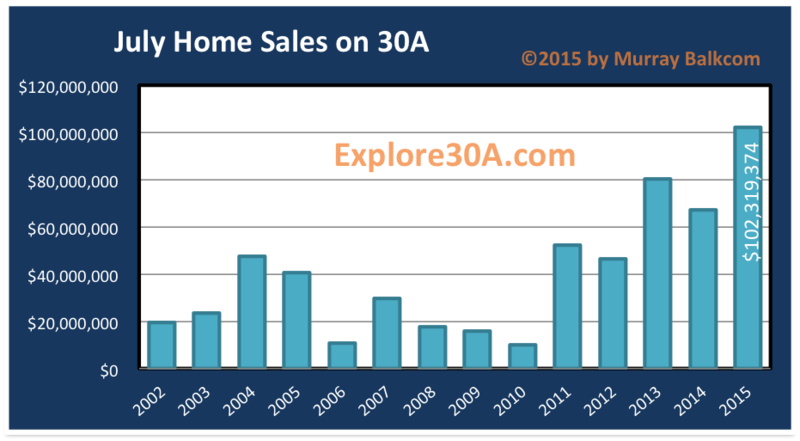 Compared to July 2014, the quantity of homes sold on 30A increased 24.6% and the volume of homes sold on 30A increased 52.2%. 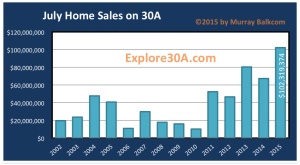 Inventory levels continue to remain fairly level, buy our sold dollar volume of home sales on 30A continue to rise at a steady pace and monthly volume sold has outpaced the 2004- 2006 market, when the best month of sales was $91.3 million. Twice this year, we’ve exceeded that former record set back in 2004, with $99.3 million sold in May 2015 and now $102 million sold in July. 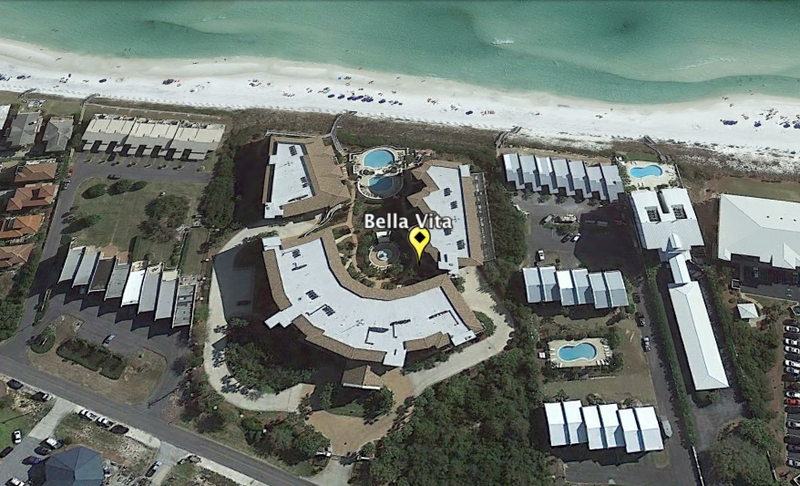 Much of the volume sold continues to be in the 30A East area. What should I expect for August sales? There is no crystal ball, but with schools starting back in many locations across the southeastern USA, I expect sales for the second half of August to settle back. 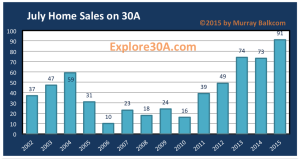 If monthly sales continue on their current track, 2015 should be a great year for real estate sales on 30A. Buyers are writing strong offers and sellers are demanding high prices. Of course as the old saying goes, “pigs get fat and hogs get slaughtered.” It will be interesting to see what happens with the sellers who are unwilling to budge on already high list prices. I have a feeling they may still be on the market next year, but who knows? Time will tell. Interested in selling your home on 30A? Contact Murray for your private consultation.